This reader request in the October 2010 issue of Bon Appetit magazine was actually for a meal of lamb shanks and lemon risotto at Restaurant Saveur but I had just cooked a lamb dish last month and still had some leftovers frozen so I decided to just make the lemon risotto. What can I say? I love, love, loved it! 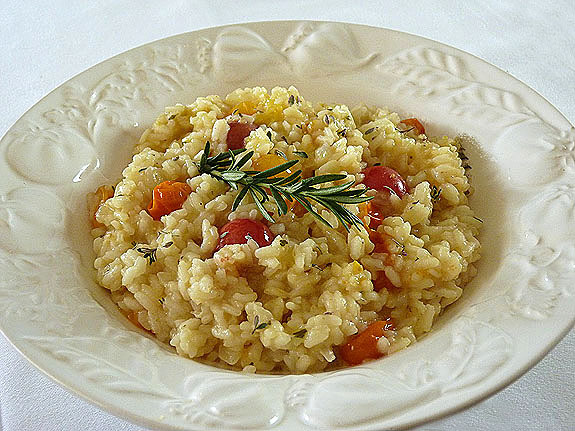 The fresh risotto flavor was great but it was the addition of roasted cherry tomatoes that made this dish shine. I literally struggled with putting it down testing it. You know…maybe I should just try one more bite to see if the seasoning needs to be corrected just a bit. It didn’t and I did…eat WAY too much during that process. Bad Barb! Like a lot of other cooks, I avoided risotto for a long time as it carries what I think is an unwarranted label of being difficult. It’s anything but. What it does require is some attention; so it’s not a dish you can walk away from but in the course of preparing dinner; if you’re in the kitchen anyhow…I think it’s really easy and the warm, sustaining results are worthy of a few minutes of attention. I had just picked up pint of the loveliest multi-color cherry tomatoes at Whole Foods. They are not a necessity to make this dish, but they certainly added a WOW! factor with their vibrant colors. I’ve made a couple of substitutions too. I hardly ever use arugula; seems difficult to find and so pricey…I often substitute fresh spinach and did the same here. I also decided to forgo using Italian parsley as called for; I didn’t have it and I didn’t miss it! Preheat oven to 350°F. Place tomatoes on rimmed baking sheet. Drizzle with 1 tablespoon oil; sprinkle with salt and pepper. Toss to coat. Roast until skins begin to wrinkle, about 12 minutes. Set aside. Pour 5 cups broth into small saucepan; bring to simmer. Cover and keep warm. Melt 1 tablespoon butter with 2 tablespoons oil over medium heat in large saucepan. Add onion; sauté until translucent, about 4 minutes. Add rice and garlic; sprinkle with salt and pepper. Stir 2 minutes. Add wine; stir until almost all liquid is absorbed, about 3 minutes. Stir in 1 cup broth. Cook until almost all liquid is absorbed, stirring frequently and adjusting heat if necessary to maintain gentle simmer, about 5 minutes. Continue to add broth by cupfuls, stirring often, until rice is tender, about 25 minutes total. Remove from heat. Stir in 1 tablespoon butter and all remaining ingredients. Fold in tomatoes. Season with salt and pepper. I saw this on Brian’s blog and fell in love! Yours looks absolutely delicious! I make a Lemon Risotto which is so different from this one! This one will be tried next. I love the flavors, love the cherry tomatoes with it. Just stunning! Yes, Whole Foods does indeed have some beautiful little tomatoes right now. I think this looks absolutely wonderful and I’ve got to give it a try. I agree about the risotto rap and you’re not the first person who has disagreed with the myth. So then why have I never tried it??? As always, beautiful photo Barb. Barb, I can’t believe how many of us made this recipe – it certainly was a winner all round. I like the rosemary addition – always works well with lemon. I can do this! I can do this!!!!!!! The timing is fabulous, because I’m thinking I’m ready for a recipe… a baby step past “assembly”….